Trine Mee Sook, Racial Representation (2013). I am currently a Visiting Researcher at University of Southern California, Roski School of Art and Design in Los Angeles. My Postdoc grant from the Danish Independent Research Council has enabled me to take a sabbatical from my Assistant Professorship at University of Copenhagen to spend five months in LA – from August 2015 until January 2016 – to work on my project on the relationship between art, racialization, and colonial history in a Danish context, while also undertaking some research for other projects at the fabulous ONE National Lesbian & Gay Archives. 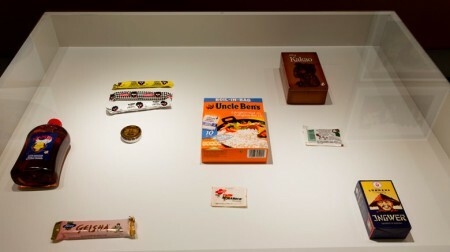 This lecture takes its starting point in works by contemporary artists Jeannette Ehlers and Trine Mee Sook that address the significant presence of racial stereotypes on the labels of popular food products in supermarkets in Denmark today. Despite the fact that these racial stereotypes can be found on products known in Danish as “kolonialvarer” (colonial commodities)––coffee, cocoa, spices, sweets, alcohol––these images are seldom understood to have any relation to Denmark’s centuries-long history as a colonial power in India, Ghana, and the Caribbean. Through a discussion of the selective memory of colonialism in Danish public culture, the lecture analyzes how the collective attachment to racial stereotypes takes the form of what could be termed a racialized affective consumption. By drawing attention to the central role that consumption––buying as well as eating––plays in the affective work the stereotypes perform in domestic Danish culture, the lecture suggests the importance of analyzing how racialization informs the understanding of pleasure and taste in a Danish context.